Some companies use broken solar cells to produce even more cost-efficient solar panels. 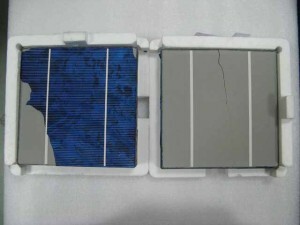 The fact that solar cells are cut from a broken cell does not mean that the quality is less than a regular solar panel. 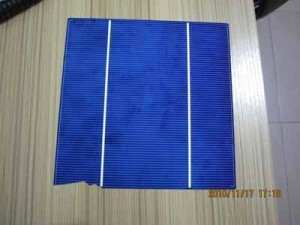 For the solar panels made of recycled broken solar cells, the same warranties apply as for the standard PV modules, however the pricing can be more attractive. Also there are plenty of hobbyist that build their own solar panels from broken cells. There are plenty of guides and videos available for hobbyist to build their own solar panels by recycling broken solar cells. It is perfectly possible to create your own solar panels from broken solar cells, even though the lamination of the solar panel is a challenge, as the techniques used in a factory can not be applied at home. An optimal silicon solar cell is about 100 µm thick. However, thickness between 200 and 500 µm are typically used, as it makes the cells easier to handle and avoid breakage. With such thin cells, you can imagine there are always solar cells that break. In fact about 1 to 3% of solar cells used at solar panel factories are broken during the production process or during transport. At the moment solar cells are produced in several countries, including China, USA, Germany, Japan and South Korea. 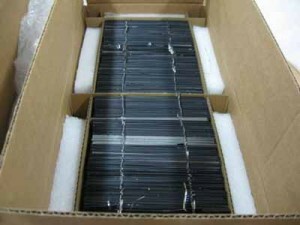 Needless to mention is that safe packaging is crucial for the transport of broken solar cells. During any transport, cells will be damaged and a certain percentage needs to be taken into account for the extra damage. Solar cells without any tin bumps (as explained below) will reduce the risk of damage during transport. Also the broken cells that have minor damages are suitable to be recycled. Processing companies cut the broken poly cells into pieces. 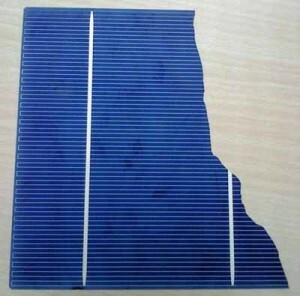 The cutting of the broken solar cell occurs vertically (parallel to the ribbons). Therefore it is important at which side the solar cell has been broken. Usually, the broken poly cells do preferably not have any ribbons still attached. Before recycling the broken solar cells, the ribbons (or tabbing wire) on the cells need to be removed. Each cell has two or three ribbons attached. The ribbons can be removed from the broken solar cells by heating up the tin with a special heater. This way the tin melts and the ribbons can be removed without damaging the solar cell. Usually, the broken poly solar cells do preferably not have any tin bumps. By removing the ribbons (or tabbing wire) from the broken solar cells, there may be uneven spots of tin left. These tin bumps need to be carefully removed from the solar cell, as these will cause trouble during the cutting of the broken solar cell. The reason for this is that the broken solar cell needs to be entirely flat and slightly under pressure while the cell is being cut. In case any tin bumps are attached to the solar cell, the cell will be damaged during the cutting. Tin bumps are removed from the broken solar cell by using a soldering machine by spreading the tin until you it is spread as a smooth surface. Half cut solar cells: new standard in product differentiation? we are an indian company. We deal with all kind of scrap. Specially with solar cells scrap. Kindly please lets us know about scrap. hi i have2 tons of solar scrap meeting your requirment.what is the price payed for that? Hello. I am collecting broken solar panels from installations i have made in the past. Is there a way i can detach the solar cells from those solar panels? Would them be usefull if i could achieve that? What would be the price for a detached solar cell (per Watt or per kgr) ? 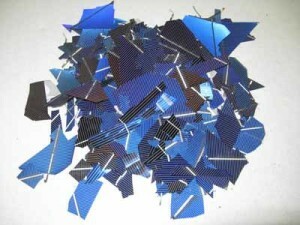 Dear sir, I am interested in buying broken solar cell scrap,any qty.Pl contact me at +919535028490.We are based in India. We need 10 MT of Solar Cell Scraps Monthly - Solar Cells with Ag is what we need.